Ship us your samples (5 sample minimum) and our experienced service department will use our GLP-compliant Quantibody® Multiplex ELISA platform to quantitatively detect up to 1000 human, 200 mouse, or 67 rat proteins. RayBiotech’s automated slide processing system and careful, thorough data analysis ensures the most efficient, high-quality, reproducible results available anywhere. A full report including all raw data and step-by-step calculations will be delivered by email (Excel and PDF formats). *5 sample minimum. Pricing for US customers only. **Sample volume listed before dilution. RayBiotech performs a 2 fold dilution on serum, plasma, and lysates unless otherwise requested. Send Us Your Samples, We'll Send You Results. 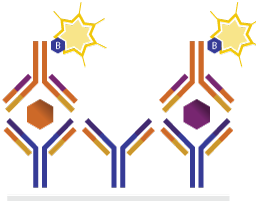 RayBiotech Quantitative Proteomics Services uses the Quantibody® glass slide array platform for simultaneous quantitative measurement of multiple cytokines, growth factors, proteases, soluble receptors, and other proteins in a wide variety of sample types. Do you want to perform the experiment, but you don't have access to a compatible laser scanner? RayBiotech now offers free slide scanning services.